At 6.30 am the alarm sounds, I shower and have a light breakfast and make my way to the elevator full of anticipation for the forthcoming days fishing. 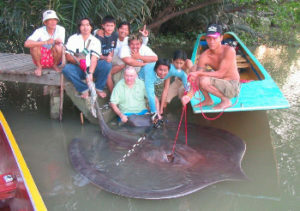 I am about to fish for Giant Freshwater Stingray. Waiting at the bottom of the apartment complex is my good friend and business partner Wuttichai Khuensuwan and our good friend Owe. After exchanging the usual greetings we load my bag into the car and begin our journey out of the city. Bangkok is possibly one of the busiest cities on Earth, even at this ungodly hour we soon start to experience traffic .It is not long before Owe successfully weaves his way through the traffic and we join the expressway, which is surprisingly free from congestion. Soon after we approach a toll gate and pay the 30 baht (45pence) toll and continue our journey out of Bangkok. As the car pushes down the expressway the scenery changes. The gigantic skyscrapers of Bangkok slowly give way to smaller buildings in the suburbs and then to a much more rural scenery. I look over my shoulder and see the usually impressive Bangkok skyline is but a speck on the horizon. After traveling for forty minutes I gaze out of the car window, for the last ten kilometers or so we have been passing a series of what appears to be rice paddy fields completely submerged with water. I ask Boy why the fields are covered in water, he informs me these fields are not rice fields but are actually salt fields and once the water subsides salt is then harvested and packaged for sale. We continue our journey through this rural setting for another twenty minutes, now we start to pass large factories and industrial sites and then shortly after we approach the city limits of the town of Samut Songkran. Owe expertly steers the car through the narrow streets and we are soon at the riverside. 8.30am After unpacking our equipment to fish for Giant Freshwater Stingray we buy some provisions from one of the local shopkeepers and head to the riverside .We are greeted by the skipper of the boat we have arranged to hire for the day and his friend. We waste no time in stowing all of our gear and provisions into the boat and prepare to begin our journey. Before we can leave there is one last thing to be done. Boy ceremoniously clasps a flower garland in between the flat palms of his hands and recites a short prayer spoken in Thai. He then gently places the garland in the water and repeats the process once more but this time placing the flowers on the front of the boat. These flower garlands have been obtained from the local temple and are intended to bring good luck for our forthcoming adventure. 08.15am The boat quickly heads upstream powered by a particularly noisy mini engine, the captain expertly guides the vessel by sitting on a large scaffold pole which is attached to the engine, this in turn acts as a rudder with a propeller on the end of it! This form of vessel sounds crude by western standards but is in fact the perfect way to travel on the Maeklong River. Known as a long-tail, these boats are highly manoeuverable and are to be found on all of Thailand’s waterways. The boat we are traveling in today is a particularly good example and has the benefit of a removable canopy to give some protection from the sun. The captain cuts the engine and the boat comes to a halt. Boy points to something in the water about one hundred metres away. At first I struggle to see what he’s talking about as the surface of the water is littered with coconut husks and various other floating debris. Suddenly I see a movement, an exceptionally large monitor lizard is taking his early morning swim! I grab my camera but fail to get a decent photo of this magnificent beast. We continue our journey upriver passing the entrance to the famous Damnoen Saduak floating market. 08.45am Once again the captain cuts the engine, slowly the boat comes to a stop. The captain’s mate located at the front of the boat proceeds to throw a rusty anchor attached to a thick rope out into the murky depths. The captain then slowly lowers a makeshift anchor made from a pair of concrete blocks from the rear of the boat and the boat comes to a halt. In thirty minutes we have traveled possibly twenty five kilometres upstream passing numerous temples. Dotted alongside the river are floating holding pens that contain juvenile Barramundi which are reared here in the brackish water conditions before being taken to the markets of Bangkok . Boy and Owe get straight down to business, they quickly impale very small live catfish of maybe a quarter of a pound onto some very big Mustad 7/0 hooks and lower them into the depths. The fish finder shows a depth of sixteen metres with a relatively flat bottom and in a short period of time four rods are all in position. 09.00am The water level is noticeably rising and a procession of floating debris continues to be pushed upriver with the invading tide, we carefully move the braided lines out of the path of the coconut husks and floating beds of weed. Everyone sits back and waits. 09.15am The water level is now at its highest showing eighteen metres on the fish finder, this Boy informs me is the optimum time and the best opportunity to hook one of these monsters. Suddenly one of the rod tips gives a slight nod and then another, Boy holds the braided mainline lightly in his finger tips feeling for movement and then winds down hard. Shaking his head he proceeds to reel in a plastic bag filled with water and we all laugh out loud. The river’s surface is now is now like a millpond and the barrage of debris seems to have stopped. It is obvious from the bow taught lines coming from the rod tips that there is still a considerable under current pushing through this section of the river, every so often one of the rod tips nods gently. 10.15am In the last hour we have managed to land a further three more plastic bags! Sadly the Maeklong River has been touched by pollution, just like pretty much every other major river in the world. Boy speaks with the captain and it is agreed we will move further upstream, the anchors are retrieved and the engine started. The captain pushes the boat round a wide bend and continues for another five minutes until he brings the boat to a stop in a very wide section of the river. Some four hundred metres ahead is a gigantic motorway bridge spanning the whole width of the main river. Anchors are again dropped and we go about repeating the process of repositioning the rods. The fish finder shows we are now anchored just at the edge of the central channel with the riverbed beneath us slowly sloping down from a depth of fifteen metres to a depth of nineteen metres out in the middle section of the river. 10.50am The rod tip on the left hand rod has just dipped down, the ratchet on the multiplier begins to click then click, click, click! 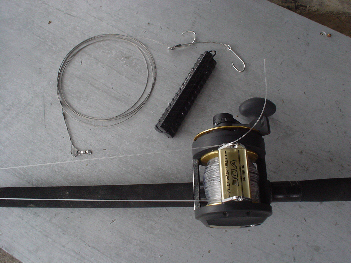 The tip continues to gently dip as the ratchet slowly releases line from the reel. After ten fraught seconds waiting I engage the clutch and wind down hard to set the hook. Only to be met by nothing! After quickly retrieving the rig it is apparent that the small live bait has been reduced to a flattened mess and that the hook has turned inside the bait making a hookhold impossible. 12.00pm As the time for the high tide comes to an end, and the river begins to return to the sea we know that we have missed our chance. In the last hour we have had one more aborted run resulting in another flattened hook bait. We head back to the town slightly disheartened, but with the knowledge that the next tide will return at five o’clock this afternoon. 16.45pm We are now back in the same area that we had the aborted takes this morning. As the rush hour traffic makes its way towards Bangkok high above us on the bridge. I relax and survey our surroundings. On our left is a very large Buddhist temple whilst on our right lays the town of Amphawa. A large procession of barges all interlinked by huge steel cables comes into view and we are forced to move position as they pass on their way towards the sea, causing great waves that push against the sides of the boat. After this interruption, we once again reposition the boat and dispatch the baits to the riverbed. It is not long before we start to receive gentle knocks on one of the rod tips. I watch as a pair of sea eagles hover above us, every so often glancing at the tips of the rods. 17.25pm Suddenly, there is a click then another and then another. The tip of the rod gently nods and the reel continues to slowly release line as the unseen monster slowly moves off some eighteen metres below. Wait! Wait! Boy urges me, as the reel continues to release the braided mainline. After what seems like an eternity he screams Now! On winding into the unseen monster it responds with a massive show of power pulling the rod tip towards the surface. I continue to pile on the pressure in an effort to crank the creature off the riverbed and the stingray continues to move away taking twenty metres of 90lb braid from the reel on its first attempt! 17.35pm Ten minutes have already passed and the fish has made a series of powerful runs testing the rod to the limit, as the roller guides creak under the pressure from this unseen monster I begin to wonder who is getting the better of who? As I tighten the drag everything suddenly goes solid. I look towards Boy, he immediately asks the captain to move the position of the boat so we can apply pressure from a different angle. 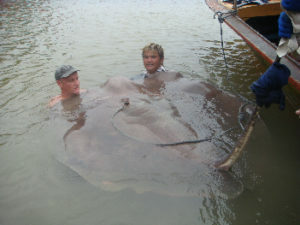 Eighteen metres below the boat an exceptionally angry stingray has buried itself in the riverbed. The captain slowly moves the boat towards the shallower water nearer to the temple, so we can attempt to apply pressure from a different angle and hopefully continue the battle in shallower water. On reapplying pressure I feel the satisfying sensation of a great weight lifting from the bottom and begin to wind furiously! The stingray seems to comply and I continue to pump the underwater alien towards the boat, then once again all goes solid! The captain starts up the engine and brings the boat to a stop above the fish. I wind down as hard as humanly possible and start to heave at this unseen beast. For the next ten minutes I continue to apply as much pressure as I can muster, seemingly with no effect on the fish! 17.45pm Once again the captain moves the boat, this time slightly upriver. I apply maximum pressure with the drag screwed down as tightly as possible. The stingray is forced from its underwater sanctuary and battle commences once again. This time the fish heads out for the main flow, this is the last thing we need with the increased weight of water and stronger flow this could be disastrous! 18.00pm In the course of the last fifteen minutes the fish has clamped itself on the bottom no less than four times, each time the boat has been moved and pressure applied from a different angle with the result of the fish being lifted off the bottom. We have now managed to get the fish into a shallower depth of twelve metres. The powerful and protracted fight is taking its toll on me and Boy has been pouring water on the spool to ease the tension on the bow- taught mainline. 18.05pm We have again moved the position of the boat some fifty metres downstream, after forty minutes connected to this beast I am seriously starting to doubt my ability to land this monster. Once again I wind down into the fish. On making contact with the colossal weight I suddenly feel the giant gently lift off the bottom .As the fish rises off the bottom I furiously pump it towards us trying to force it to the surface replacing yard upon yard of line onto the multiplier. The fish makes a few vain attempts to dive down back into the murky depths, but this time without the power and determination of its previous efforts. As the battle reaches its final stages a large boil appears on the surface two metres away from the boat. With the rod fully bent into the monster I haul once again and the leader slowly comes into view. Massive swirls start to break the surface and Boy expertly grabs the heavy mono leader gently guiding the still unseen giant towards the boat. As the prehistoric beast appears from the depths, a huge whip like tail cuts through the water and begins to dangerously flail from side to side. Owe leans over the side of the boat and wearing a thick welder’s glove firmly grasps the creature half way down its tail rendering it helpless. The defeated monster lies on the surface before us. Boy reaches under the creature’s huge body placing his hands carefully into the fish’s mouth attempting to haul the beast onto the boat. With a width of well over one metre and an overall length of possibly two and a half metres to the tip of its tail, this fish is clearly huge! The captain lends Boy a hand hauling the monster into the boat, whilst Owe and the captain’s mate carefully grasp the base of its deadly tail making sure they avoid its two venomous barbs. On the second attempt they manage to boat the monster! Exhausted after the epic battle I sit back and look in awe at the huge prehistoric beast. Abducted from its underwater home the alien-like creature lies totally helpless on the floor of the boat. A small piece of thick tarpaulin is taped around the venomous barbs protecting us from their potentially lethal contents. On inspection of the area under the base of the creature’s tail it is clear this is a large female. The captain opens up the engine and we head towards the supports of the nearby bridge. A length of soft but strong nylon rope is threaded through the fish’s nasal cavity and then firmly knotted. On our arrival at the bridge the boat is secured .The monster is placed back into the river attached to the nylon chord whilst we prepare for the forthcoming photo session. As the nylon chord is retrieved the fish once again comes into view. With the help of Owe and the captain’s mate the stingray is once again hauled out of its watery home. After battling with the fish for almost fifty minutes I have little strength left in my arms and my back is in agony. I struggle to hold up the monster, even with the help of Owe whilst Boy snaps off a series of shots on the camera. It is decided not to try to weigh the fish. We have no means of raising the monster high enough to get an accurate reading on the scales and we do not wish to harm the fish or ourselves in attempting it! After taking the trophy shots the stingray is lowered back into the water, the tarpaulin is removed and the nylon chord is unknotted allowing the monster to sink slowly back into the murky depths. As the stingray gently glides back to its watery home I ask Boy “How big?” Boy consults the captain and his mate. “Sixty kilos plus!” is his reply. One week after this capture Boy took a client from Singapore to the same part of the river and caught an even bigger male specimen estimated at between seventy five and eighty kilos. The battle on the second occasion was a much more protracted affair lasting one and a half hours and required the help of another angler to tame the gigantic beast. This was followed by no fewer than five more captures over the next month. Due to the high amount of alien encounters we had experienced in the area, we have decided to name this section of the river Area 51. I returned to the Maeklong River one month later for a two day expedition to take some location photos for this article and to try to capture another of these mammoth beasts. The first day resulted in a blank with not even an aborted take. On this particular day the river received only one noticeable tidal influx and the water levels remained relatively high throughout the day .This was the result of one of the big dams in the north being opened and a massive amount of freshwater entering the river system. The following day saw conditions much the same, we returned again to Area 51 and hooked an unstoppable freight train that we battled with for almost two hours until the leader finally gave way and snapped. Unfortunately, we hooked this monster on a large fixed spool reel and at one point even with the drag tightened to its limit there was little we could do as braid was still being ripped from the reel and the 500g rod was stretched to its absolute limit! Who knows what size this unseen monster could have been? I have never experienced power of this magnitude from a fish and would say it was probably one of the most exhilarating and adrenaline filled moments of my entire fishing career. Sadly, this would be the end for this trip to the Maeklong River as the following day we had arranged an exploratory expedition to another of Thailand’s mighty rivers the Bang Pakong.